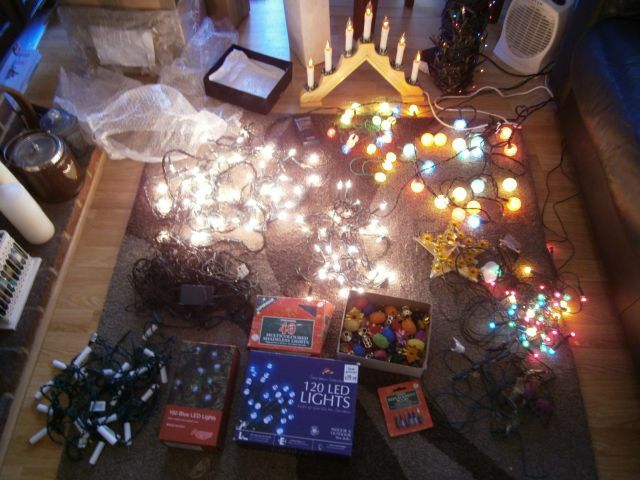 Ok i went up into the Loft today to see how many Christmas lights I've bought over the years for the family and me, When i was sorting out some of the boxes two dam wasps came out of the 400 set of lights in the back of the photo one stung me, i thought i was getting electrocuted first of then released it had stung me, i killed the bugger. There is Woolworths sets, Argos, Some rare globe sets from the 80s from NOMA Also the Newest set i have is LED you see in the box from NEXT shop 2 years ago. Some of the sets don't work, as you can see, needs plugs or fixing the bulbs. The Candle Arch one of the bulbs is dodgy too. Yay the site works again for me, And Thanks all, ill be using 3 of them in my bedroom soon in a months time.